This is actually a very good halo comic created by marvel. To be honest the story about a group of spartan crash landing on a forerunner world and being attacked by a crazy Ai and they have to work with the covenant is fantastic. in the end we see a band of heroes beating the invading covenant forces who crashed on the planet. 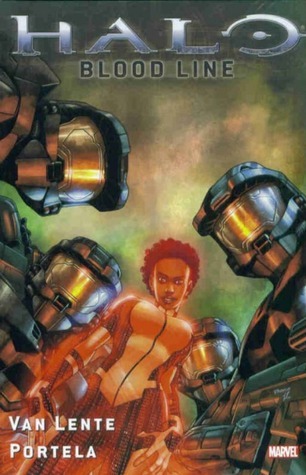 Thanks marvel for making a good halo comic! Actually a pretty interesting expansion of the Halo universe. Not so much in terms of setting but in terms of (relative) emotional depth. Though the decision to make Black Team basically nameless, faceless and identical did not particularly simplify the reading experience. Very enjoyable, short halo story, excellent artwork. what's not to like? The artwork has some nice moments but nothing really spectacular or innovative. The story is painfully shallow. Nothing interesting happens except for the downplayed ending. The ending is dense and yet still underwhelming. Kind of a "then he turned into a bird and the world blew up" sort of ending. After the awesome work (especially the unbelievable and boldly styled visuals) in the Halo Graphic Novel, this is a sad offering. At least it's very short. I found the story to be deeper than I expected. It primarily dealt with the theme of how beliefs influence action, which surprised me when the catalog copy focused only on the family dynamic of teams. Much of the art reminded me of the '90s Teenage Mutant Ninja Turtles graphic novels, which gave the book bonus points for nostalgia. I love reading the books based on the video games I play. I love to read more of the story that surrounds the game and this is one of those books. I really liked the fact that this was also a graphic novel. It's good to see Spartans and Covenant come together and hate each other on a more personal level. Great short story! Adds depth to the characters and their history. It was an interesting take on the more personal side of a group of Spartans.